Digital Kindergarten: Kindergarten Angry Bird Competition! I will always advocate for full day kindergarten. My first year of teaching K my class was split into am/pm and I hated it. I was very limited to reading, writing, math and I always felt rushed. The afternoon kids were drooping, and so was I. I hated repeating the same thing I'd already done in the am. The kids were already staying all day, just with an enrichment teacher (a para Ed) for the time they weren't with me. By February I'd had enough and combined my kiddos... And It was amazing. Suddenly I had time to do projects I'd felt guilting fitting in before. So, for the next 4 years I've begged to keep all day kindergarten no matter the class size. and I've loved it. However, the kids are so tired by Friday I have instituted 'Fun Friday'. We stick to routine M-Th and then change it up on Friday. I have a parent volunteer in the morning, so I do messy projects and things I won't tackle on my own with so many busy kiddos. I try to plan special events on Fridays and save the best ideas for Fridays... One of which was our own game of Angry Birds. When I first got the iPads I downloaded Angry Birds for my family to play, and of course we all loved it. I left the free version on the class iPads and of course my students loved it. Recently I decided to take 'non educational' apps off the class iPads, including Angry Birds. Yes, I know, many teachers will insist that the game teaches physics, strategy, and other worthwhile skills. I however, think it's pure fun and would rather have my students use apps that are more meaningful during learning times. Then, normally kind students started arguing over the iPads I hadn't changed (erased the fun games on) yet. A parent of a somewhat emotional child told me he'd cried at home because I was taking Angry Birds away. 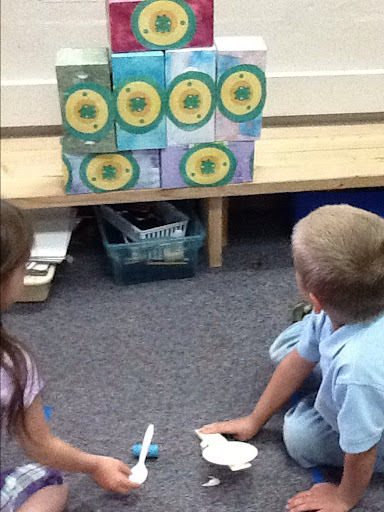 The kids were using blocks and plastic counting bears to build Angry Bird style structures. So I finally decided to cave in, and put Angry Birds on all the iPads again. 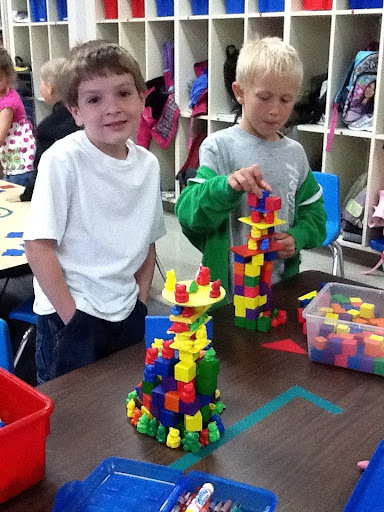 I also started planning a way to play Angry Birds in class after seeing the intricate structures they were building. http://ilearntechnology.com/?p=3970 came to my attention and I knew it was time to go hog wild (pun anyone?) and embrace the craze. After all, it is my job to captivate young learners and make curriculum to fit their interests and the standards. First, I let the kids play the game on the iPad or other device. I also showed a few YouTube clips of lifesize angry bird games and one stopmotion paper recreation. Then I printed off the piggy targets (targets available if you follow the above link). I printed and attached them to tissue boxes for the practices and then plastic cups for the competition (easier to knock over). I collected various materials for the launchers and angry birds. For the launchers i had some wooden parts; shims, popsicle sticks, blocks and tape, small plastic frisbees, straws, plastic spoons, rubber bands, thread spools, pipe cleaners. For the birds a student suggested eraser caps, I wrapped styrofoam eggs in tape, and we also used large white dried beans for the birds. I put the kids in groups of their choice, but that didn't work well as the kids all wanted to make their own. Then I let them work alone or as a group. 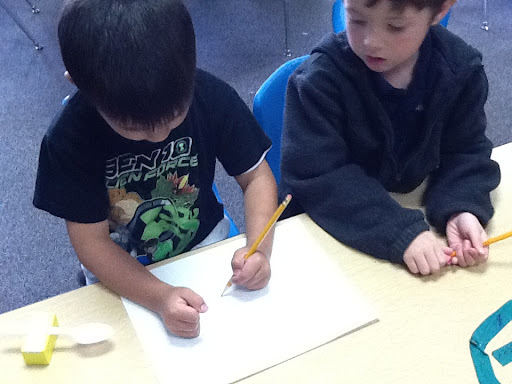 I did ask them to talk about and draw pictures of their designs. Some were great depictions of what they actually created. After they'd had time to create, we went outside to practice using targets made from tissue boxes and the pig targets I'd printed off. Then I gave more time for adjusting their launchers, and then for practicing shooting at the targets, which were now taped onto plastic cups. We assigned points: 10 for a small cup being hit, 100 for a knock over. 50 for a big cup, 500 for a knock over. I announced the competition would be held the next week, with school made and homemade launchers. 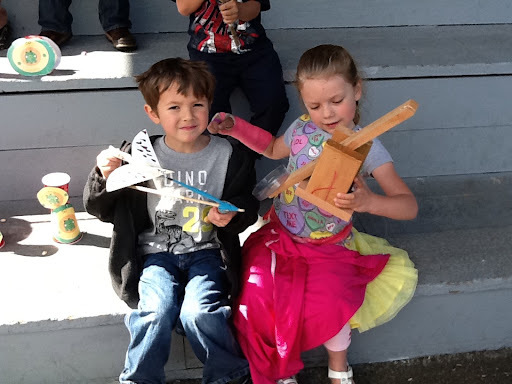 Suggested Rules for homemade launchers: kid directed and assembled, with some parent help, No store-bought (one child did bring a professional slingshot) or touching the "bird" allowed. Our local stores did not carry any angry birds merchandise so I bought a $4 slingshot from Fred Meyers and three slingshot airplane gliders as prizes. 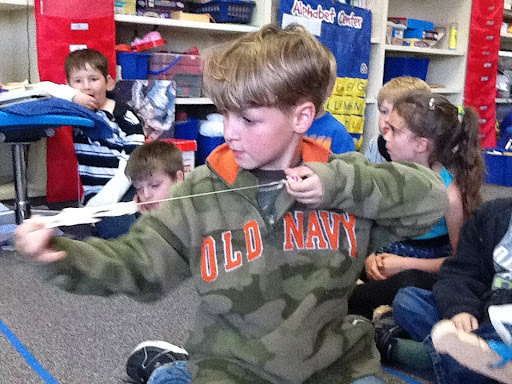 I also printed off copies of the targets for all students so they could play at home. Each child was given 3 shots of 1-3 angry birds of their choice. They got two chances, for a total of 6 shots. I think this was the coolest project I've ever done in K. The kids had so much fun and were very creative. The 1st-4th graders who observed us practicing were so jealous I hasn't done it with them when I was their teacher. What fun! Thank you for sharing how you used Angry Birds with kindergartners. Wow! I love this. It would fit in well with a unit on structures, machines and stability! I agree! I wish I'd done this activity during my National Boards year... It would have made a great science/math activity.